Well, if you are looking for something romantic we have the perfect idea! Take to the water and fall in love all over again aboard a Key West Romantic Sunset Sail. We know there are a lot of romantic things to do in Key West, but the most unique and romantic thing to do in Key West is step aboard our classic yacht for an unforgettable memory. Choose from a variety of Key West Cruises for your special evening: Pick a Key West romantic sunset sail, or a romantic boat ride through the night on a Key West Full Moon sail. Take a deep breath, relax and feel the wind in your hair. Sip on Champagne and have a quiet, intimate conversation with your loved one as you. Drift by Mallory Square or cruise over to Fort Zachary Tayler while sipping on Champagne. Sit aboard this classic boat to enjoy moments of laughter and take in the breath taking views. Whether it is a Key West Sunset Sail, Full Moon Sail or one of our Special Holiday Events you and your loved one will share an experience that will last a life time which you are sure to make this a regular date idea. Let us take your breath away with a Key West Full Moon Sail. A truly magical way to experience Key West is to take to the waters by full moon light! 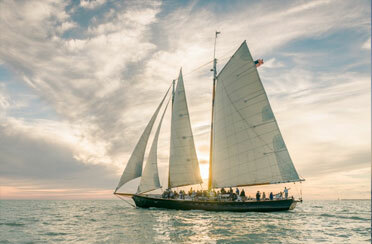 This is the most romantic, moonlight sailing adventure that is yours to be had aboard Key West’s most stunning sailboat. Our 105-foot wooden schooner, America 2.0 is the most elegant schooner in town. Sit back and relax with us on this Key West Full Moon Sail while cruising through the evening. Basking in the golden moonlight that dances on the night waters you are sure to have a memorable event. You will enjoy complimentary beer, wine, champagne, soda, and water. We encouraged you to make the most of the event by bringing aboard your own picnic! 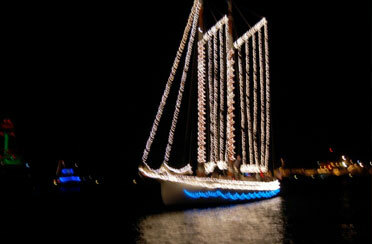 Join us for the Key West Lighted Boat Parade, a favorite maritime holiday event. Sit aboard the most elegant schooner decked out in holiday decor. The America 2.0 will parade through the Bight and Harbor of Key West. We will be showing off our crews creative and imaginative design of twinkling lights that will dazzle all. 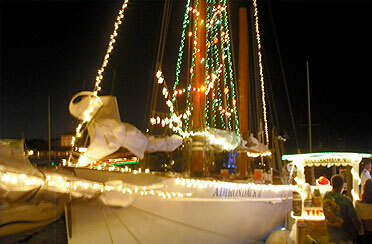 Up to 30 other Key West yachts will join us in the annual Key West Lighted Boat Parade. Cruise aboard America 2.0 while taking in this magical display of holiday spirit. All of the participating yachts will have the opportunity to show off their holiday decorations as they glide by the viewers and judges at the Schooner Wharf Bar. Do you want the best seat in the house for New Year’s Eve in Key West? Join us aboard America 2.0 for an epic New Year’s Eve Bash! Our Key West New Year’s Eve Event aboard the Schooner America 2.0 is one that must not be missed. You will experience VIP dockside access to the famous Schooner Wharf Bar “Lowering of the Pirate Wench”. We are the very venue that hosts the Lowering of the Pirate Wench from the rig of our Schooner America 2.0! So enjoy this timeless celebration on the most exclusive boat in the Historic Bight. Our special ’21 and older’ event features complimentary beer, wine, champagne, well drinks, soda, water, and delicious hors d’ oeuvres! Our Key West New Year’s Eve Bash will separate you from the crowds and give you the best seat in the house for a front row viewing of this epic event. This Valentine’s Day, take to the water and fall in love all over again. 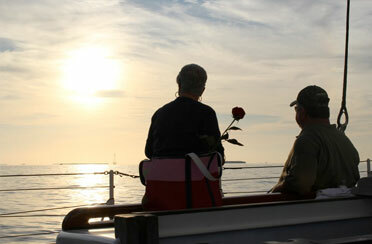 Join us aboard Schooner America 2.0 on a Key West Valentine’s Day Sunset Sail. This is an unforgettable sunset sail that will tickle your taste buds and create a memory to last a lifetime. 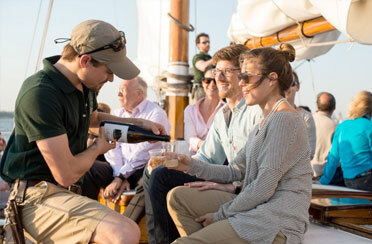 Celebrate this Valentine’s Day with your special someone on our Champagne and Aphrodisiacs Pairing Sunset Sail. Our crew will cater to you as you sail through the beautiful turquoise green waters aboard the Schooner America 2.0. You and your loved one will be able to take in all the romance that this Key West Valentine’s Day Sunset Sail has to offer. We will treat you to a delicious pairing menu that is sure to entice. The menu consists of hors d’ oeuvres expertly paired with champagnes and sparkling wines from around the world! So look no further and join us for a romantic evening on the water.